It's that time of year: TheSpeedGamers are at it again! Since their formation in 2008, TheSpeedGamers (TSG) have raised almost a million dollars in support of various charities including Direct Relief International, the Make-A-Wish Foundation, St. Jude Children's Research Hospital, and many more. Tomorrow, these Guinness-World-Record-holding speedsters will be powering through the mainline Final Fantasy games in an unprecedented 120-hour stream, and 100% of the donations will go directly to St. Jude. This is one streaming marathon that you won't want to miss. You'll be able to catch the action starting at 6PM CST on TheSpeedGamers Twitch channel, which you can find right here. If you're a Twitch Prime member, don't forget that you're also able to offer them a free premium subscription which will kick another $5 their way courtesy of Amazon. This year's theme, TSG announced in a recent press release, is Polygons vs. Pixels. "During the marathon, the attendees will be split into two teams: Team Pixels and Team Polygons. Each person is represented by an avatar that displays their stats: attack and defense. Every time you donate to St. Jude, you can choose a marathon attendee that you would like to power up. "For every $5, an attendee will have their stats increased. Twice a day, the two teams will have 4 players from each side pitted against each other in battle. The battle will take the two sides’ stats into consideration when calculating a victor, with the winning team gaining a point for their side. At the end of the campaign and the marathon, one team will win out as the champion." Additionally, TSG revealed that if donations reach $30,000 by 6PM CT on Wednesday, July 19 (when the event is set to conclude), they'll extend the marathon by another 24 hours. This is a monumental event that will be full of incredible video games, great commentary, like-minded fellowship, and most importantly, open-handed giving to those in need. Want another fun way to give and get something in return? 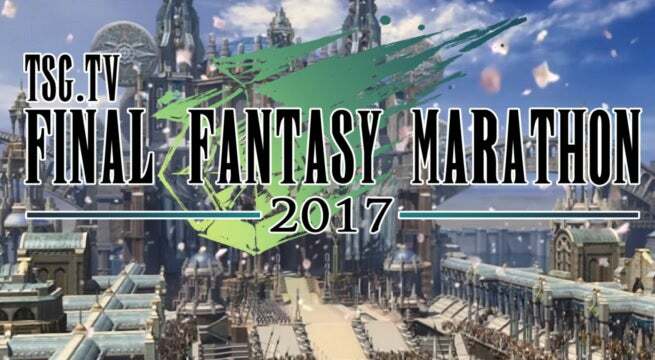 TSG has teamed up with Fangamer to sell a few incredible Final Fantasy themed shirts during the marathon. These brilliant shirts can be seen in the gallery below. These guys will set you back $24, and $10 of every purchase will go straight to St. Jude with the rest of the marathon earnings. Tune in tomorrow and grab one for you and a friend!